Protein and plaque. Plaque and protein. Did you know that one helps remove the other? Uh huh. It’s true. The proteins found within nuts help to remove plaque as well as provide nutrients for our teeth. 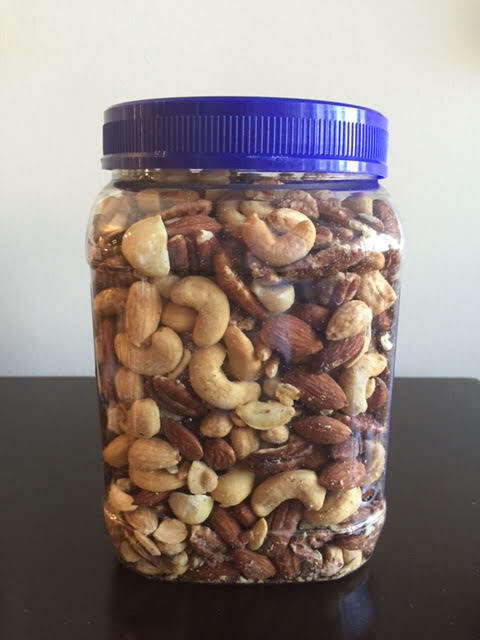 You probably already knew that nuts contain healthy fats and protein and are a super snack. Great grab and go option for fuel when you are on the run. You know plaque. It’s that nasty, slimy stuff that builds up on your teeth over time. Thank you, bacteria! Proteins in nuts not only satisfy your hunger for short periods of time, but help break down the build up of plaque. Forgot your toothbrush. Used up all of your toothpaste. No worries. Perhaps this is a sign that you should visit your local farmer’s market. Eating raw, crunchy vegetables and fruit can help clean teeth after a not so wholesome meal. If you find yourself without a brush or paste after a meal, go ahead and bite into an apple for dessert. Then slug some water back. Your teeth will actually be a whole lot cleaner from chewing up the apple than if you let leftover food particles linger in your mouth. While the high water content of fruits and vegetables aid in cleaning your teeth, it’s always best to drink some water after a meal or snack to rinse out your mouth. Heard of xylitol? It’s okay if you haven’t. We here at Sugar Fix Dental Loft don’t judge. Xylitol occurs naturally in apples. An apple a day keeps the dentist away (in a good way, that is). Try swapping out cake and ice cream for an apple every now and then for dessert. A simple Fuji or Gala apple will help remove sugars — and bacteria that feed off the sugars — that adhere to the surface of your teeth after consuming carbohydrate-heavy food and drink. Almonds are always a great snack and so easy to pack. I cannot tell you how many times I’ve seen coworkers with bags of almonds on their desks. These nuts are excellent sources of calcium, which protects and rebuilds tooth enamel. It’s very important to protect enamel because once enamel starts to deteriorate, you are more susceptible to tooth decay, which leads to cavities. The less acid leftover in your mouth after eating or drinking, the safer the enamel. The next time you find yourself in the grocery store, stop by the nut section and scoop up some chestnuts. Although we don’t typically even think about chestnuts if it’s not Christmas time, these buggers contain loads of vitamin C, which is key to healthy gums. Also great for healing wounds. Canker sores, be gone! Have more questions about the power of protein found in nuts and what it can do for your smile? Give Dr. Jessica T. Emery a call to set up a consultation at Chicago’s Sugar Fix Dental Loft.